When planning your federal retirement – it’s important to remember that your pension will be reduced. There are seven main pension reductions that affect federal employees in retirement. Most federal employees will be affected by at least three reductions. If you choose to leave a survivor annuity, your pension will be reduced for the cost of this annuity while you’re alive. The amount of this reduction depends on the survivor annuity you choose. In most cases where people choose the ‘full’ survivor annuity – it will cost you 10% of your gross pension to pay for this benefit. (It could be much higher if your survivor is considered an ‘insurable interest’). Do remember that the ‘full’ survivor annuity means that your survivor will only get *half* of your pension when you pass away. To learn more about your survivor annuity choices, as well as their costs and benefits – click on FERS Survivor Benefits or CSRS Survivor Benefits. Sometimes people want to decline doing a survivor annuity and do a ‘Pension Max’. The concept behind Pension Max is that you can (theoretically) replace the benefit of the survivor annuity from your federal pension at less cost on the private market. However – in my opinion – I think Pension Max is a *BAD* idea for 99% of people. It is possible that Pension Max can work very well in certain cases. But the risks of Pension Max going wrong are so high – the cases where it works well are so rare – that you should only proceed with great caution. Most of the time – I think it’s just not a good idea for federal employees. The lions share (90 – 98%) of your federal retirement pension will be taxable at ordinary income tax rates. Most federal employees I meet pay an effective rate (not the marginal rate) of 15% – 20%. So I would encourage you to plan on federal income taxes of at least 20%. Of course, everyone’s tax situation is unique. I know that for most folks, 20% will be high – but I’d rather recommend you putting aside more for taxes than less. And if your state has an income tax (Alaska does not) – be sure to factor that in as well. Remember to account for the cost of your FEHB coverage in retirement. FEHB plans, options and costs will be different for every state. In Alaska, a good family plan is north of $410 / month. Of all of your federal retirement benefits – I believe your biggest benefit as a federal employee is to keep FEHB in retirement. 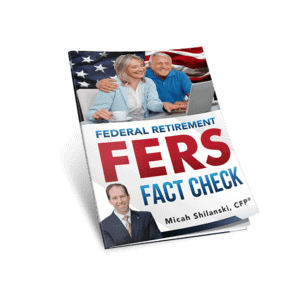 Be sure to factor the cost of your FEHB premiums into your federal retirement plans. Depending on the type of federal retirement you take – you may be subject to a pension reduction for early retirements. If you’re a FERS and take an MRA+10 Early FERS Retirement, there’s a 5% penalty for each year you’re under age 62. So if you’re 56 when you retire on MRA+10 retirement, your FERS pension would be reduced by (62 – 56 = 6) 6 years x 5% = 30% PERMANENT Reduction. Some FERS choose to do a Postponed FERS Retirement to avoid this hefty penalty. CSRS who took an Early CSRS Retirement (only available if it’s offered to you) will have their federal retirement pension reduced by 2% for each year they’re under age 55. If you’re retiring under regular immediate retirement (CSRS or FERS) – you don’t have to worry about this reduction. But if you are going out on an early federal retirement, make sure you figure this reduction into your plans. Deposits and redeposits can be tricky. For more information, check out the CSRS/FERS Handbook, Chapter 50 Section 50A3.1-3 Reductions in Annuity. This reduction will only affect you if you choose to keep FEGLI into your federal retirement. However – most folks do *NOT* continue FEGLI into retirement because it becomes very very expensive as you age. In general, FEGLI can be less expensive than some private policies when you’re young and just starting out in federal service. Somewhere around mid-career, FEGLI and private polices usually cost about the same. But as you near retirement, FEGLI is significantly more expensive than private insurance. See for yourself by looking at the cost tables for FEGLI Option B . You’ll see the cost of FEGLI Option B double from when you’re age 54 to 55. And more than doubles again between age 59 and 60. However, if you are in poor health FEGLI might be cheaper than private insurance. Or you’re un-insurable on the private market (ex: cancer survivor) – FEGLI might be your only option. If you do choose to continue FEGLI into retirement – remember to include the premium costs in your federal retirement plans. If you choose the Long Term Care (LTC) plan that OPM sponsors through John Hancock, you have the option to have your premiums come right out of your federal retirement pension. You can also choose to pay your premiums directly. Either way, be sure to factor the premium costs into your planning. Let’s take a look at an example of how these reductions might affect your federal retirement pension. Let’s say you’re going out on a regular immediate retirement – so there is no reduction for early retirement in this case. In our example, you elect the full survivor annuity option. You’ll be continuing your FEHB coverage into retirement – but you won’t have FEGLI or FLTCIP. For round numbers, let’s say your gross pension would be $2,000/month. The cost of your ‘full’ survivor annuity will be 10% of $2,000, so $200. Taxes will vary, but I would encourage you to set aside 20% for federal income taxes. So 20% of $2,000 is $400. Your FEHB cost will vary depending on your state, and your plan. Here in Alaska, a good family FEHB plan costs about $410 a month. Everyone’s personal situation is unique – so your personal situation will vary – but you can see from this example that the reductions can take a hefty chunk out of your federal retirement pension. It’s important to factor these costs in when you plan *before* you retire. In this first example, we looked at a fairly common scenario for someone going out on a regular federal retirement. But if you’re considering an early retirement that has a pension reduction – the results are even more dramatic. Let’s take a look at someone who would be retiring under FERS MRA+10 Early Retirement rules. Let’s say their MRA is 56, but they’re retiring at age 58. To show the impact of the early retirement reduction – we’ll keep the gross pension amount of $2,000 from our previous example. Because they’re going out under MRA+10 rules, their federal retirement pension will be reduced. The reduction is 5% for each year younger than age 62. 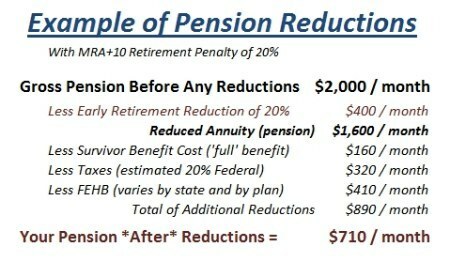 In this example, their federal pension will be *PERMANENTLY* reduced by 20% (4 years x 5% = 20%). So if the gross pension started at $2,000/month, after the age reduction of $400, we now have $1,600/month. The next reduction to factor in is the cost of the survivor benefit. Let’s say this person is doing a ‘full’ survivor benefit – so the cost is 10% of the age-reduced pension amount. 10% of $1,600 is $160. If we’re setting aside 20% for taxes, that will be $320 a month. And we’ll say that FEHB will still cost about $410 a month. (Again FEHB plan costs vary by state and by options). Take a look at your personal situation. List out the reductions that will impact your federal retirement and estimate how they’ll affect your pension. Once you determine which reductions might affect your federal retirement – the next step is to consider how these numbers will change over time. For example, your pension *may* be increased by COLA in retirement (but some years the COLA is 0%). Your survivor annuity costs will remain fixed at its percentage of your pension (ex: 10% of gross pension). And I happen to think that taxes will be increasing dramatically in the future. In general what I see is that federal employees gross pensions go up by very small amounts over time. But the reductions coming out of their pensions are going up significantly faster. This results in a pension pinch. Your gross pension might go up by 1% in a given year – but your FEHB costs might have increased by 7%. So your gross might be going up – but your net is going down. Your federal retirement pension will not keep pace with your increased costs of living. That’s why it’s so important to have your own personal investments to fill the gap. When you’re planning your federal retirement – be sure to take these common pension reductions into account. Concerned About Your Federal Pension? The rules for Federal Retirement can be overwhelming – but it’s important to understand them *before* you retire. If you’re thinking about retirement, you’ll want to sign up for our monthly E-Zine Newsletter. Each month we send out a new and original article on important concepts that will help you plan your federal retirement.